Energy efficiency and renewable energy are said to be the twin pillars of sustainable energy policy and are high priorities in the sustainable energy hierarchy. In many countries energy efficiency is also seen to have a national security benefit because it can be used to reduce the level of energy imports from foreign countries and may slow down the rate of energy at which domestic energy resources are depleted. From the point of view of an energy consumer, the main motivation of energy efficiency is often simply saving money by lowering the cost of purchasing energy. Additionally, from an energy policy point of view, there has been a long trend in a wider recognition of energy efficiency as the "first fuel", meaning the ability to replace or avoid the consumption of actual fuels. In fact, International Energy Agency has calculated that the application of energy efficiency measures in the years 1974-2010 has succeeded in avoiding more energy consumption in its member states than is the consumption of any particular fuel, including oil, coal and natural gas. Moreover, it has long been recognized that energy efficiency brings other benefits additional to the reduction of energy consumption. Some estimates of the value of these other benefits, often called multiple benefits, co-benefits, ancillary benefits or non-energy benefits, have put their summed value even higher than that of the direct energy benefits . These multiple benefits of energy efficiency include things such as reduced climate change impact, reduced air pollution and improved health, improved indoor conditions, improved energy security and reduction of the price risk for energy consumers. Methods for calculating the monetary value of these multiple benefits have been developed, including e.g. the choice experiment method for improvements that have a subjective component (such as aesthetics or comfort) and Tuominen-Seppänen method for price risk reduction. When included in the analysis, the economic benefit of energy efficiency investments can be shown to be significantly higher than simply the value of the saved energy. The first EU-wide energy efficiency target was set in 1998. Member states agreed to improve energy efficiency by 1 percent a year over twelve years. In addition, legislation about products, industry, transport and buildings has contributed to a general energy efficiency framework. More effort is needed to address heating and cooling: there is more heat wasted during electricity production in Europe than is required to heat all buildings in the continent. All in all, EU energy efficiency legislation is estimated to deliver savings worth the equivalent of up to 326 million tons of oil per year by 2020. The mainstream trend in automotive efficiency is the rise of electric vehicles ([email protected] or hybrid electric). Hybrids, like the Toyota Prius, use regenerative braking to recapture energy that would dissipate in normal cars; the effect is especially pronounced in city driving. Plug-in hybrids also have increased battery capacity, which makes it possible to drive for limited distances without burning any gasoline; in this case, energy efficiency is dictated by whatever process (such as coal-burning, hydroelectric, or renewable source) created the power. Plug-ins can typically drive for around 40 miles (64 km) purely on electricity without recharging; if the battery runs low, a gas engine kicks in allowing for extended range. Finally, all-electric cars are also growing in popularity; the Tesla Model S sedan is the only high-performance all-electric car currently on the market. ^ Indra Overland (2010). "Subsidies for Fossil Fuels and Climate Change: A Comparative Perspective". International Journal of Environmental Studies. 67: 203–217. ^ Prindle, Bill; Eldridge, Maggie; Eckhardt, Mike; Frederick, Alyssa (May 2007). The twin pillars of sustainable energy: synergies between energy efficiency and renewable energy technology and policy. Washington, DC, USA: American Council for an Energy-Efficient Economy (ACEEE). Retrieved 2016-04-03. ^ Zehner, Ozzie (2012). Green Illusions. London: UNP. pp. 180–181. ^ Kennan, Hallie. "WORKING PAPER: STATE GREEN BANKS FOR CLEAN ENERGY" (PDF). Energyinnovation.org. Retrieved 26 March 2019. ^ "Weatherization in Austin, Texas". Green Collar Operations. Archived from the original on 2009-08-03. Retrieved 2010-07-16. ^ Steve Lohr (November 29, 2006). "Energy Use Can Be Cut by Efficiency, Survey Says..." The New York Times. Retrieved November 29, 2006. ^ "PRESS RELEASE : Vienna UN conference shows consensus on key building blocks for effective international response to climate change" (PDF). Unfccc.int. Retrieved 26 March 2019. ^ ISO 17743:2016 - Energy savings — Definition of a methodological framework applicable to calculation and reporting on energy savings. International Standards Association (ISO). Geneva, Switzerland. Retrieved 2016-11-11. ^ ISO 17742:2015 — Energy efficiency and savings calculation for countries, regions and cities. International Standards Association (ISO). Geneva, Switzerland. Retrieved 2016-11-11. ^ a b c International Energy Agency: Capturing the Multiple Benefits of Energy Efficiency. OECD, Paris, 2014. ^ Weinsziehr, T.; Skumatz, L. Evidence for Multiple Benefits or NEBs: Review on Progress and Gaps from the IEA Data and Measurement Subcommittee. In Proceedings of the International Energy Policy & Programme Evaluation Conference, Amsterdam, The Netherlands, 7–9 June 2016. ^ Ürge-Vorsatz, D.; Novikova, A.; Sharmina, M. Counting good: Quantifying the co-benefits of improved efficiency in buildings. In Proceedings of the ECEEE 2009 Summer Study, Stockholm, Sweden, 1–6 June 2009. ^ B Baatz, J Barrett, B Stickles: Estimating the Value of Energy Efficiency to Reduce Wholesale Energy Price Volatility. ACEEE, Washington D.C., 2018. ^ "Ecosavings". Electrolux.com. Archived from the original on 2011-08-06. Retrieved 2010-07-16. ^ "Ecosavings (Tm) Calculator". Electrolux.com. Retrieved 2010-07-16. ^ "Pathways to a Low-Carbon Economy: Version 2 of the Global Greenhouse Gas Abatement Cost Curve". McKinsey Global Institute: 7. 2009. Retrieved February 16, 2016. ^ a b c d Environmental and Energy Study Institute. "Energy-Efficient Buildings: Using whole building design to reduce energy consumption in homes and offices". Eesi.org. Retrieved 2010-07-16. ^ a b "Empire State Building Achieves LEED Gold Certification | Inhabitat New York City". Inhabitat.com. Retrieved October 12, 2011. ^ Alison Gregor. "Declared the tallest building in the US — One World Trade Center is on track for LEED". United States Green Building Council. Retrieved December 12, 2015. ^ "ENERGY STAR Buildings and Plants". Energystar.gov. Retrieved 26 March 2019. ^ Juha Forsström, Pekka Lahti, Esa Pursiheimo, Miika Rämä, Jari Shemeikka, Kari Sipilä, Pekka Tuominen & Irmeli Wahlgren (2011): Measuring energy efficiency. VTT Technical Research Centre of Finland. ^ Matar, W (2015). "Beyond the end-consumer: how would improvements in residential energy efficiency affect the power sector in Saudi Arabia?". Energy Efficiency. doi:10.1007/s12053-015-9392-9. ^ Yezioro, A; Dong, B; Leite, F (2008). "An applied artificial intelligence approach towards assessing building performance simulation tools". Energy and Buildings. 40 (4): 612. doi:10.1016/j.enbuild.2007.04.014. ^ "LEED v4 for Building Design and Construction Checklist". USGBC. Archived from the original on 26 February 2015. Retrieved 29 April 2015. ^ "Honeywell, USGBC Tool Monitors Building Sustainability". Environmental Leader. Retrieved 29 April 2015. 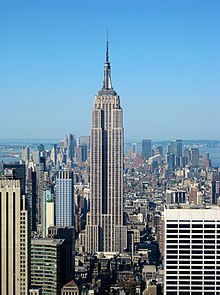 ^ "Visit > Sustainability & Energy Efficiency | Empire State Building". Esbnyc.com. 2011-06-16. Retrieved 2013-08-21. ^ Pekka Tuominen, Francesco Reda, Waled Dawoud, Bahaa Elboshy, Ghada Elshafei, Abdelazim Negm: Economic Appraisal of Energy Efficiency in Buildings Using Cost-effectiveness Assessment. Procedia Economics and Finance, Volume 21, 2015, Pages 422–430. ^ "Heat Roadmap Europe". Heatroadmap.eu. Retrieved 2018-04-24. ^ a b "Energy Atlas 2018: Figures and Facts about Renewables in Europe | Heinrich Böll Foundation". Heinrich Böll Foundation. Retrieved 2018-04-24. ^ "Suppliers Obligations & White Certificates". Europa.EU. Europa.eu. Retrieved 2016-07-07. ^ Federal Ministry of Economics and Technology (BMWi); Federal Ministry for the Environment, Nature Conservation and Nuclear Safety (BMU) (28 September 2010). Energy concept for an environmentally sound, reliable and affordable energy supply (PDF). Berlin, Germany: Federal Ministry of Economics and Technology (BMWi). Archived from the original (PDF) on 6 October 2016. Retrieved 2016-05-01. ^ The Energy of the Future: Fourth "Energy Transition" Monitoring Report — Summary (PDF). Berlin, Germany: Federal Ministry for Economic Affairs and Energy (BMWi). November 2015. Archived from the original (PDF) on 2016-09-20. Retrieved 2016-06-09. ^ Schlomann, Barbara; Eichhammer, Wolfgang (2012). Energy efficiency policies and measures in Germany (PDF). Karlsruhe, Germany: Fraunhofer Institute for Systems and Innovation Research ISI. Retrieved 2016-05-01. ^ Agora Energiewende (2014). Benefits of energy efficiency on the German power sector: summary of key findings from a study conducted by Prognos AG and IAEW (PDF). Berlin, Germany: Agora Energiewende. Retrieved 2016-04-29. ^ Löschel, Andreas; Erdmann, Georg; Staiß, Frithjof; Ziesing, Hans-Joachim (November 2015). Statement on the Fourth Monitoring Report of the Federal Government for 2014 (PDF). Germany: Expert Commission on the "Energy of the Future" Monitoring Process. Archived from the original (PDF) on 2016-08-05. Retrieved 2016-06-09. ^ "National Action Plan on Energy Efficiency (NAPE): making more out of energy". Federal Ministry for Economic Affairs and Energy (BMWi). Retrieved 2016-06-07. ^ Making more out of energy: National Action Plan on Energy Efficiency (PDF). Berlin, Germany: Federal Ministry for Economic Affairs and Energy (BMWi). December 2014. Retrieved 2016-06-07. ^ a b c "Gabriel: Efficiency First — discuss the Green Paper on Energy Efficiency with us!" (Press release). Berlin, Germany: Federal Ministry for Economic Affairs and Energy (BMWi). 12 August 2016. Archived from the original on 22 September 2016. Retrieved 2016-09-06. ^ Grünbuch Energieeffizienz: Diskussionspapier des Bundesministeriums für Wirtschaft und Energie [Green paper on energy efficiency: discussion document by the Federal Ministry for Economic Affairs and Energy] (PDF) (in German). Berlin, Germany: Federal Ministry for Economic Affairs and Energy (BMWi). Retrieved 2016-09-06. ^ Amelang, Sören (15 August 2016). "Lagging efficiency to get top priority in Germany's Energiewende". Clean Energy Wire (CLEW). Berlin, Germany. Retrieved 2016-09-06. ^ Sekuła-Baranska, Sandra (24 May 2016). "New Act on Energy Efficiency passed in Poland". Noerr. Munich, Germany. Retrieved 2016-09-20. ^ Huntington, Hillard (2011). EMF 25: Energy efficiency and climate change mitigation — Executive summary report (volume 1) (PDF). Stanford, CA, USA: Energy Modeling Forum. Retrieved 2016-05-10. ^ a b c d e Environmental and Energy Study Institute. "Industrial Energy Efficiency: Using new technologies to reduce energy use in industry and manufacturing" (PDF). Retrieved 2015-01-11. ^ "Tips to improve your Gas Mileage". Fueleconomy.gov. Retrieved 2010-07-16. ^ "Automotive Efficiency : Using technology to reduce energy use in passenger vehicles and light trucks" (PDF). Eesi.org. Retrieved 26 March 2019. ^ "Effect of Intake Air Filter Condition on Vehicle Fuel Economy" (PDF). Fueleconomy.gov. Retrieved 26 March 2019. ^ "What Makes a Fuel Efficient Car? The 8 Most Fuel Efficient Cars". CarsDirect. Retrieved 2018-10-03. ^ "Fiat 875cc TwinAir named International Engine of the Year 2011". Green Car Congress. ^ Nom * (2013-06-28). "La Prius de Toyota, une référence des voitures hybrides | L'énergie en questions". Lenergieenquestions.fr. Archived from the original on 2013-10-17. Retrieved 2013-08-21. ^ ltd, Research and Markets. "Global LED and Smart Street Lighting: Market Forecast (2017 - 2027)". Researchandmarkets.com. Retrieved 26 March 2019. ^ Edmonton, City of (26 March 2019). "Street Lighting". Edmonton.ca. Retrieved 26 March 2019. ^ Kyba, C. C. M.; Hänel, A.; Hölker, F. (2014). "Redefining efficiency for outdoor lighting". Energy & Environmental Science. 7 (6): 1806. doi:10.1039/C4EE00566J. ^ Dietz, T. et al. (2009).Household actions can provide a behavioral wedge to rapidly reduce US carbon emissions. PNAS. 106(44). ^ Breukers, Heiskanen, et al. (2009). Interaction schemes for successful demand-side management. Deliverable 5 of the CHANGING BEHAVIOUR project. Funded by the EC (#213217). ^ "National Renewable Energy Laboratory. (2012)". En.openei.org. Retrieved 2013-08-21. ^ Huesemann, Michael H., and Joyce A. Huesemann (2011). Technofix: Why Technology Won't Save Us or the Environment, Chapter 5, "In Search of Solutions II: Efficiency Improvements", New Society Publishers, Gabriola Island, Canada. ^ a b The Rebound Effect: an assessment of the evidence for economy-wide energy savings from improved energy efficiency Archived 2008-09-10 at the Wayback Machine pp. v-vi. ^ Greening, Lorna A.; David L. Greene; Carmen Difiglio (2000). "Energy efficiency and consumption—the rebound effect—a survey". Energy Policy. 28 (6–7): 389–401. doi:10.1016/S0301-4215(00)00021-5. ^ Kenneth A. Small and Kurt Van Dender (September 21, 2005). "The Effect of Improved Fuel Economy on Vehicle Miles Traveled: Estimating the Rebound Effect Using US State Data, 1966-2001". University of California Energy Institute: Policy & Economics. Retrieved 2007-11-23. ^ "Energy Efficiency and the Rebound Effect: Does Increasing Efficiency Decrease Demand?" (PDF). Retrieved 2011-10-01. ^ Kyba, C. C. M.; Hänel, A.; Hölker, F. "Redefining efficiency for outdoor lighting". Energy & Environmental Science. doi:10.1039/C4EE00566J. ^ Tsao, J Y; Saunders, H D; Creighton, J R; Coltrin, M E; Simmons, J A (8 September 2010). "Solid-state lighting: an energy-economics perspective". Journal of Physics D: Applied Physics. 43 (35): 354001. Bibcode:2010JPhD...43I4001T. doi:10.1088/0022-3727/43/35/354001.